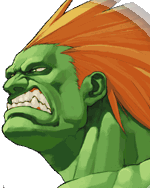 Click here for more information about Blanka's other fighting game appearances. When Blanka discovered that a Street Fighter tournament had been held without him, he was in disbelief. How could the World Warriors compete without him? Determined not to let it happen a second time, he made sure that he was present and accounted for in the second and third EX tournaments. Blanka cared very little about whether he won or lost. He just wanted an excuse to have a good time and go wild. At some point during the second tournament, Blanka was pitted against Dhalsim. Although their paths had crossed before, Blanka was captivated by Dhalsim's ability to contort his body in strange ways. Dhalsim took pity on Blanka, seeing the mind of a harmonious creature trapped inside a body that others found frightening. When the third tournament was announced and fighters could select partners to fight alongside, it was Blanka who sought Dhalsim as a partner, and Dhalsim graciously accepted. This page was last edited on 28 November 2007, at 18:58.